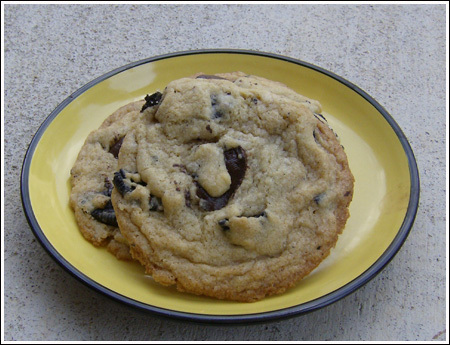 Oreo Chunk Cookies are large chewy chocolate chip cookies with big chunks of Oreos and chocolate chips. Heat oven to 350 degrees F. Beat butter and sugars until smooth. Add vanilla and egg and mix until combined. Divide the dough into about 12 equal sections and shape into balls - try not to crush up the Oreos too much. Place dough balls 3 inches apart (6 per cookie sheet) on parchment lined or non-stick cookie sheet and flatten tops slightly. You don't want to flatten it too much, you just don't want it to look like a ball. Press pieces of dark chocolate into dough. Bake for about 15 minutes or until brown around the edges.